Special thanks to D' Fat Mona Lisa Café for extending this food review invitation. 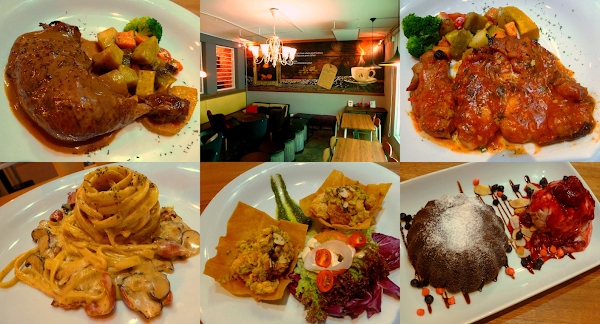 D' Fat Mona Lisa Café is located within walking distance from 3 institutes of learning: Penang Free School, Heng Ee High School and Han Chiang College. With ample of parking spaces within its spacious compound, D' Fat Mona Lisa is popular place for youngsters and families alike. The entrance of the restaurant is a spot of photographic opportunity. The restaurant's mascot is a plump version of Mona Lisa. This is the work of Fernando Botero, a Colombian artist and who is known for depicting people in exaggerated forms. A year and a half has transpired since my last visit to this eatery. The food menu has been revised and expanded since the restaurant's opening. The kitchen is led by an experienced chef with life-long career in the hoteling industry. D' Fat Mona Lisa has brought him out of retirement; it seems that career chefs cannot permanently retire. D' Fat Mona Lisa serves all-day breakfast such as the Big Platter (RM19.00). The hearty meal includes beef bacon, sausage, sautéed mushrooms, scrambled egg, baked beans, hash browns, toasted baguette and salad. The breakfast menu includes free flow of coffee and tea until 11:00am (or until 11:30am on Sundays). Although I have tried the Expresso Chicken (RM19.00) before, the recipe has been modified significantly. Whole chicken leg is marinated with espresso, allowing muscle fibers to tear down and become extremely tender. Due to lengthy preparation process and the desire to maintain freshness, only a limited quantity is available every day. The gravy is also formulated from espresso, carrying a unique sense of bitterness which tends to polarize people. Just like durians, it is understandable why some people love it while other hate it. Nevertheless, I think it is a good idea for one to give this dish a try before deciding for oneself. The dish of Salmon Cup (RM24.50) is presented in an interesting manner which I have not seen before. Served over crispy sheets of rice flour are salmon and various seasoning. Almond flakes are used as garnish to deliver some crisp in each bite. If I were not told that the salmon was deep-fried, I would have thought that it was baked. Indeed, the salmon does not feel greasy at all. Savoriness is enhanced using fresh egg yolk, not salted egg although the result is quite similar. In addition, salmon is infused with herbs like tarragon to give the desired fragrant aroma. Grilled BBQ Chicken features a boneless chicken fillet that is glazed with specially-prepared barbecue sauce. The sauce also includes tomato purée for mild sense of tanginess. Garnished with dried parsley, the chicken is succulent bite after bite. Served on the side are roasted potato, sweet potato and pumpkin. Carbonara Beef (RM28.00) is prepared using creamy roux made from cream. Egg is not used. Besides the creamy sauce, al dente fettuccine pasta is also flavored with smoked beef bacon and sautéed mushrooms, whose roles are to provide salty and savory tastes respectively. Meanwhile, people who do not take beef may consider the chicken, seafood or vegetarian versions of this dish. D' Fat Mona Lisa has special menus occasionally in order to introduce new dishes before they appear on the main menu. An example is Karaage Fish (RM22.00) which includes a free drink during lunch. For this dish, snapper is coated in flour batter, then deep-fried to golden perfection. Another key appeal is wasabi mayonnaise sauce, a creamy emulsion with sweet-tangy overtones. Moving on to desserts, the Lava Cake (RM18.00) is a cocoa-rich treat for the most faithful chocolate lovers. The unmistakable aroma of cocoa permeates the immediate vicinity as soon as the cake is served. On the side, there is a scoop of strawberry ice cream topped with chunky strawberry sauce, almond flakes and chocolate chips. The chocolate cake is filled with chocolate sauce, which when warm, appears as viscous liquid. As soon as the cake is punctured, chocolate sauce oozes out like lava from an erupting volcano. The sauce eventually solidifies as it cools down. Last but not least, I like the distinctive aroma of Salted Caramel Coffee (RM13.50) as well as its milky consistency. However, I feel that the drink is too sweet; the barista may want to tone down the amount of caramel to an extent where the aromatic aspect is served. With a relaxing ambience and quality food ingredients, I think the food at D' Fat Mona Lisa is reasonably priced. As far as I can tell, the waiting staff is also very attentive to my needs. I think this is a nice place to dine regardless whether it's for a business lunch or a family dinner. Directions: From Penang Free School, drive along Jalan Free School towards the round-about. D' Fat Mona Lisa Café is about 100 meters before the round-about, just opposite the retirement home. There is ample parking space within the compound.